Today, the Basque game of 2017 IMSA Elite Mind Games was completely over. In the first round of men’s group, the three players with the same top mark slowed their steps in the game. Ding Liren drew with Harikrishna.The competition between Grischuk and his compatriot Andreikin also ended in a tie. Meanwhile Wang Hao and Yu Yangyi beat their opponents Ivanchuk and Mamedov with 2-0 , 1.5-0,5 respectively. Therefore, five players maintained the leading position till the four rounds ended. Such fierce occasion makes the last round most crucial , Yu Yangyi and Harikrishna drew with each other , while Korobov rocketed to the top spot as the result of Ding Liren’s unexpected failure. 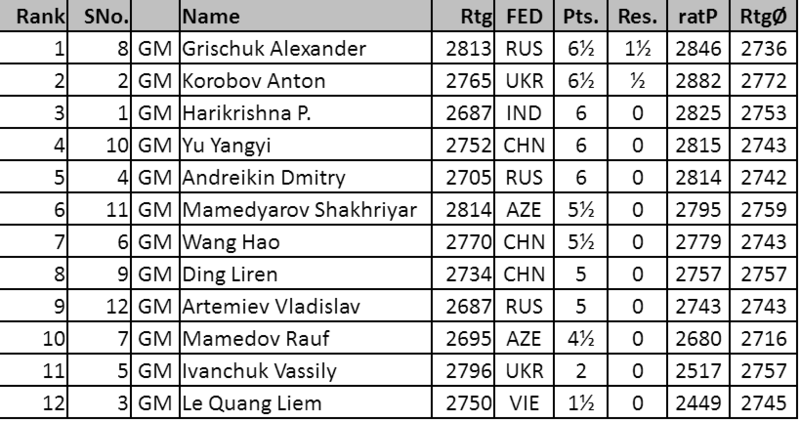 As to another key round, Grischuk struggled hard against Wang Hao with 1.5-0.5 to make it with 6.5 points of 10 games. Grischuk overwhelmed Korobov taking the trophy by the tie-break advantage. Korobov took the sliver medal with similar 6.5 points. Harikrishna，Yu Yangyi and Andreikin all scored 5.5 to share 4-6. Mamedyarov got the similar 5.5 with Wang Hao,and accordance with tie-break, Mamedyarov took the sixth place. In the women's group competition, Chinese player Zhao Xue , who played brilliantly yesterday, continued to be powerful today, In today's first round,she won Mariya Muzychuk in the score of 2-0. 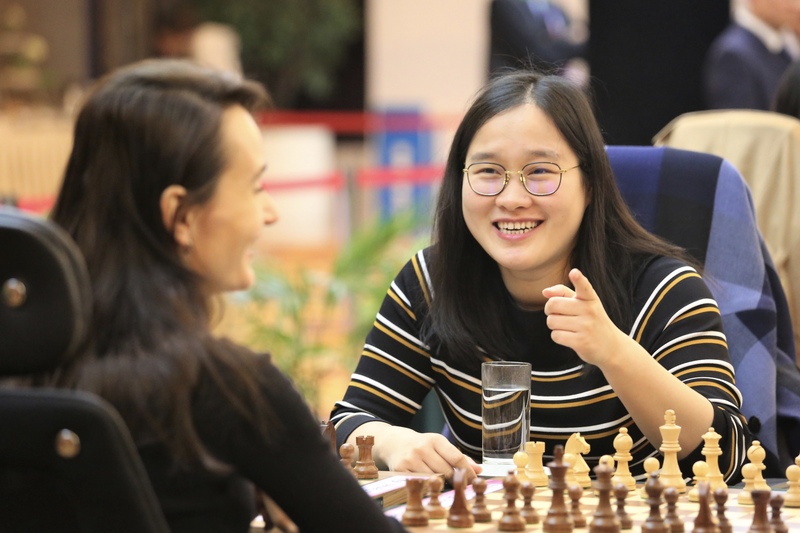 After a scuffle with Ju Wenjun, Lagno lost the game scored 0.5-1.5, making Zhao's dominant position enlarged , although she occupied the lead position with Zhao Xue yesterday. The last round, Zhao xue by 1.5-0.5 defeated Harika, then Lagno fail to Ushenina again with 0.5-1.5 , which was caught up with by Anna Muzychuk who defeated Ju Wenjun with 2-0. The final score is that Zhao Xue got 7.5 points out of 10 rounds to win the championship, Anna Muzychuk got 6.5 points second, Lagno and Harika with the product 5.5, after a tie-break comparison, Lagno was on third, Harika stay behind. kosteniuk shared 5-6 position with Usheninain by the similar 5 points. Till now, all 2017 IMSA Elite Mind Games have been accomplished. In 2017 IMSA elite mind game chess field, the first 3 rounds of the Basque competition has been started . In men’ group, Chinese player Ding Liren performed well scored two 1.5-0.5 over Le Quangliem and His compatriot Wang Hao. Currently, Ding Liren is ahead of India player Harikrishna and Russian player Grischuk by higher tie-break, they all took 4 points out of 6 games. Yu Yangyi, Andreikin and Mamedov all got 3.5, trailed by half point to take the 4-6 place. 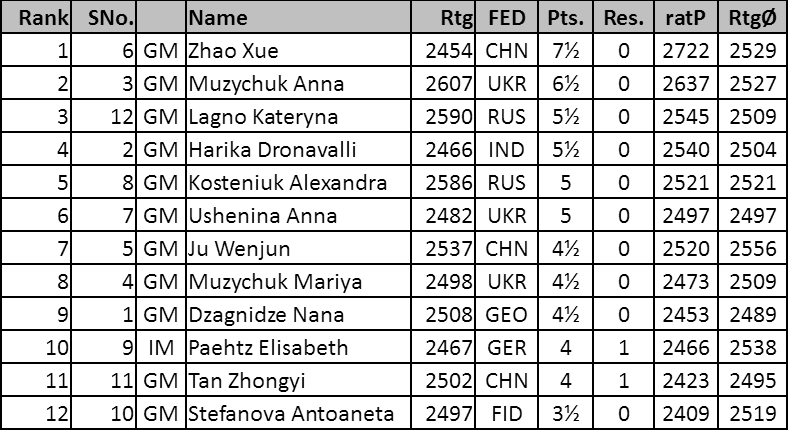 in women’s section, Chinese Zhao Xue played Lagno、Anna Muzychuk and Ushenina in sequence with a recording of four wins, one draw and a solitary defeat. Benefited from two win in-a-row, Russia player Lagno scored 4 overall ,which made her on the top of the leaderboard with Zhao Xue. Comparing with the tie-break, Zhao Xue is taking the first place , Lagno took the second while other 7 players scored 3 points from third to nine place. So in terms of the tie-break,3-6 places are: Maria Muzychuk is on the third, followed by Ju Wenjun，Harika and Tanzhongyi. Tomorrow is the final day of basque competition, the last two rounds would start . After 11 rounds of intensive battle, the IEMG chess blitz games have been all finished today. Russian players performed prefect as they won all medals at men’s group. Yesterday’s board leader Artemiev Vladislav continued his hot streak, as he beat Alexander Grischuk at the key battle. Even though he lost to Vassily Ivanchuk, it didn’t influence his No.1 ranking since he scored 16 out of 22, and won the tie-break against Grischuk who came on 2nd. Dmitry Andreikin came 3rd with 14/22, Yu Yangyi came 4th with 12/22, and Vassily Ivanchuk and Ding Liren came 5th and 6th with both 11/22. In Women’s group, Antoaneta Stefanova and Ju Wenjun performed very well today, winning games consecutively and came over the top against previous board leader Nana Dzagnidze and Alexandra Kosteniuk. Ju Wenjun kept leading the board until round 19, but unfortunately she lost to compatriot Zhao Xue at the 20th round, then consecutively beaten by Dronavalli Harika at the following round. Meanwhile, Stefanova grasped the chance to gain two wins and followed a decisive point at the very last round, locked the title with 14.5/22. Ju Wenjun and Kosteniuk listed 2nd and 3rd with both 13.5/22 after tie-breaking. Kateryna Lagno came 4th with 13/22, Harika and Zhao Xue scored both 12.5/22 to listed 5-6th accordingly. In IMSA Elite Mind Games Chess Blitz game, 11 rounds have been accomplished today. In women's group, Dzagnidze and Kosteniuk both played pretty good, tying for the leading position by 7.5 in the whole rounds. Because of hot-streak to some players ranking on the top, Dzagnidze took up the first place benefited from the tie-break , even though did lose three rounds , one of which was beat by Paehtz who won her only one game. Kosteniuk failed one game to the current world champion Tan Zhongyi and on second position. Lagno scored 7 points to take the third position. The new champion of blitz games Stefanova was in the fourth with 6 points, followed by Chinese player Tan Zhongyi and Zhao Xue scoring 6.5. In men’s section, Russia young player Artemiev made an absolutely great record: losing to Ivanchuk , drawing with Korobov , winning the remaining nine games in a row and scored 9.5/11. It is undoubted that he is on the top of the leaderboard currently with marvelous score. Russia player Grischuk lost to Artemiev in a critical round with and later failed to Harikrishna and scored 8.5 ranking second. Chinese player Ding Lire unfortunately lost some certain rounds in a well-sounded situation and took the third position with blitz champion Andreikin by 6.5 points, while Wang Hao, Yu Yangyi and Harikrishna shoring the 5th-7th with 5.5. Tomorrow is the second half competition for chess blitz games, please stay tuned to get the latest results. In IMSA Elite Mind Games Chess Rapid game Day-2, two champions have been crowned. 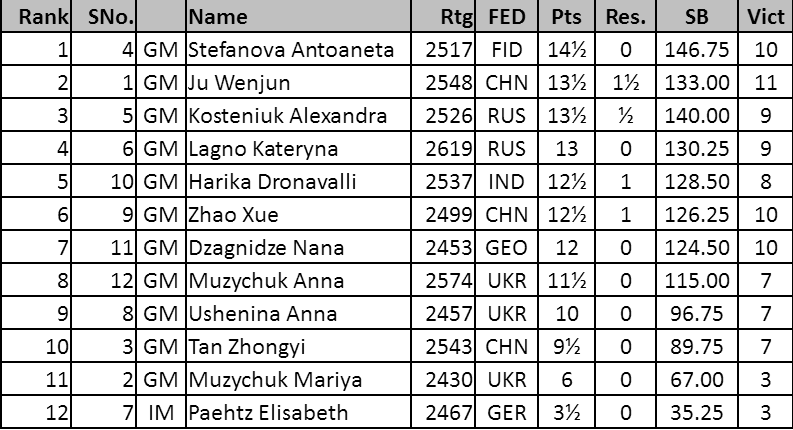 In women’s competition, Stefanova lost today’s first round to Anna muzychuk, leading to a decline in rank but by winning over Kosteninuk in the last round , her points jump to first place again. For Muzychuk sisters, they drew with Ushenina and Dzagnidze respectively in the last round. As a result, the five players, stefanova, Anna Muzychuk, Maria Muzychuk, Lagno and Ushenina, all scored 4.5. After tie-break, stefanova took women’s rapid gold medal. Anna muzychuk took the second position, followed by her sister Mariya . Lagno and Ushenina ranked the forth and fifth by the lowest small point and Harika was on the sixth place , scored 4 points. In men’s group, the battle had been more fierce. 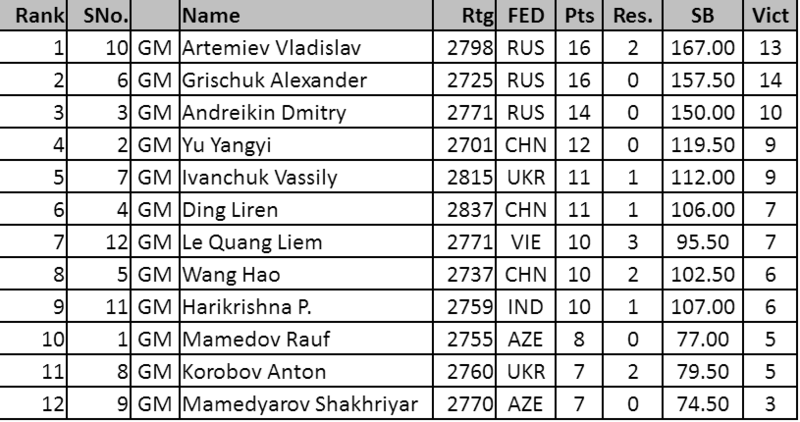 After a tense battle of another three rounds, Andreikin got marvelous victory today.he defeated former leader Mamedyarov and Wang Hao in a row .Before the final round, he had been in the top ranking along with Mamedyarov and Wang Hao. In the final round , Andreikin and Mamedyarov both drew, unfortunately the former leader Chinese GM Wang Hao lost to Le Quangliem. Therefore, Andreikin, Mamedyarov and Le Quangliem got the same score of 4.5 . After tie-break, Andreikin locked the first. The second and third places went to Mamedyarov and Le Quanglian. Chinese players Ding Liren and Wang Hao were on the fourth and fifth place by scoring 4. Korobov ranked the sixth with 3.5. Madam Chen Zelan, IMSA President, inspected chess venue today. Tomorrow there will be eleven rounds for chess blitz games. 2017 IMSA Elite Mind Games starts!